Argan Oil For Hair, Face, Skin & Nails - 100% Pure Natural USDA Organic - Premium Quality 4oz Bottle - Triple Extra Virgin Moroccan Oil Argania Spinosa - Effective Anti-Aging Skin Moisturizer - Rich in Vitamins and Fatty Acids - Treats Stretch Marks, Pimples, Dry Cracked Skin, Fine Lines, Acne Scars, Nails, Cuticles, Wrinkles + Frizzy Damaged Hair and Split Ends - Guaranteed Results - Try It Risk Free!!! Argan Oil is one of my favorite oils, It has such a wide span of helpfulness to many parts of your body. It is great for your hair, skin, nails, and your face. After Icleansed morning and/or night massaged a few drops of Argan Oil directly onto my face and neck. Since argan is considered a dry oil, it absorbs quickly and is not greasy. I love that because I have oily skin. After the shower while myhair is still wet I add a few drops of Argan oil to my hair, ends and scalp to hydrate and moisturize my hair. It’s especially nourishing if your hair is dry from daily use of a blow dryer, straight-iron or curling iron. If you have dry nails massage it into your nails and it will replenish you nails after a couple of uses. I also use it on my hands after I moisturize them to give them an even more softer feel. 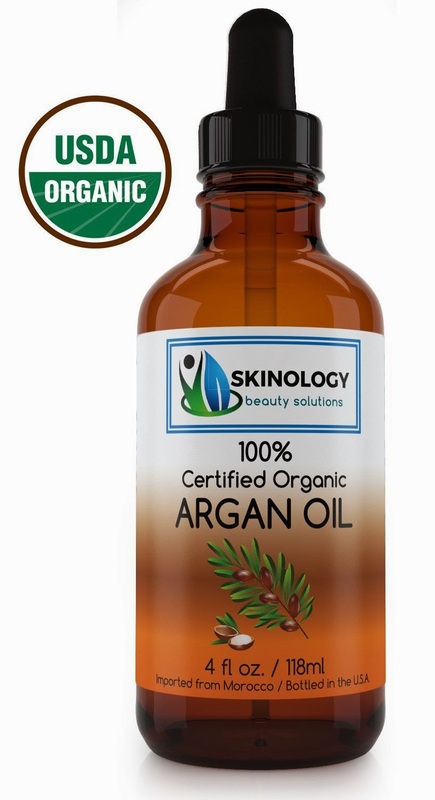 Skinology Beauty Solutions makes a great Argan Oil product. I highly recommend it. I received this product complimentary for my honest and unbiased review. I have been using it now for almost a month.